In the early 18th century the “Carolina Road”, part of the “Great Wagon Road” was the route for Pennsylvania and Virginia settlers moving south in search of land and a new life. At the time of the Revolutionary war it was the heaviest traveled road in Colonial America. Many of these pioneers settled on the fertile farm land along the Yadkin River Basin in central North Carolina. On the Great Wagon Road, Jomeokee (“Great Guide”, as named by the Saura Indians) Pilot Mountain served as a landmark for German Moravian settlers traveling to their new home of der Wachua, or Wachovia, present day Winston-Salem. Wachovia quickly became an established urban center and led to further settlement of the Piedmont region. This history-rich, north-central region of North Carolina still holds the beauty and appeal that it did for our forefathers. Welcome to 5101 Spainhour Mill Road, Tobaccoville, NC. With Pilot Mountain as a backdrop, this farm is a rich mixture of natural beauty and enhanced man-made features. The attention to design detail and extraordinary stewardship of the land is immediately obvious. A gated entrance to this private estate gives way to rolling vistas in every direction. Sturdy board fenced pastures boarders the long, paved drive approaching the home. 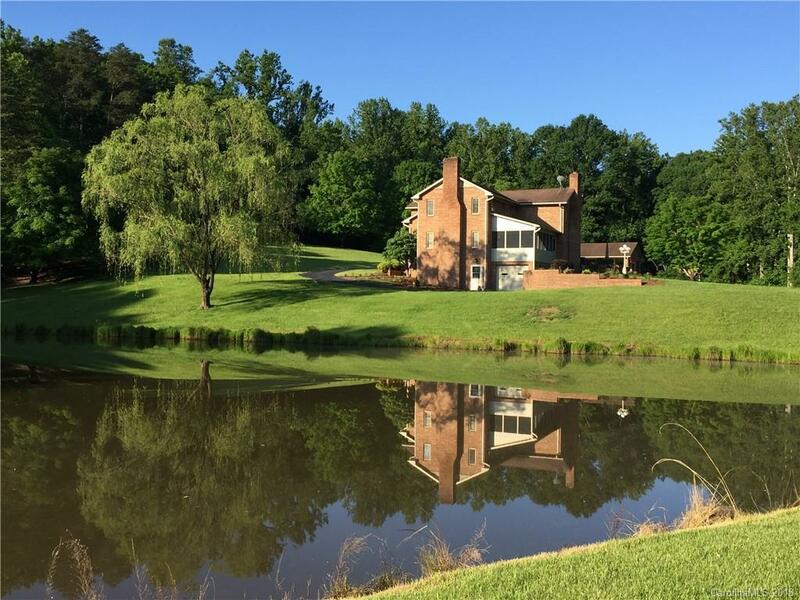 At the Y intersection the drive directs you to the barn and associated equestrian amenities; continue past the intersection and wrap around a tree shrouded pond to the home, situated on a rise overlooking the pond. Built in 1979, this 3,425 sf home has undergone extensive renovation and significant recent upgrades (2017-2018). In addition to the efficiency and style seen throughout, the primary descriptive is “warm”. The main level has a great room opening to a loft with the center piece a floor-to-ceiling rock fireplace, one of four in the home. An adjacent dining room opens to the keeping room and kitchen. The kitchen epitomizes the home efficiency and has all new appliances. It also has a bright breakfast nook with access to patios on two sides. The main level has a large guest bedroom and bath. Outside living is emphasized with a 21’ x 12’ covered and screened porch connecting the great room and keeping room. Two brick patios surrounded by manicured landscaping offers ideal spots to relax with nature off the breakfast nook. Upstairs, an oversized master suite has a marble surround fireplace and newly remolded bath with large frameless glass and tile shower and double vanity with granite countertop. This level has a guest bedroom and bath and large loft. The lower level is marked by extraordinary storage and flex space. The focal space is a living room with fireplace and adjoining kitchenette. There is a full bath, laundry room, storage/work rooms and a garage/shop with garage door. The space offers endless uses. The paved drive circles the home and is part of a large motor court in front of the large two-car detached garage and adjacent two-car carport. Mature landscaping, manicured lawn and awe-inspiring views, particularly of the pond, mark the grounds around the home. Seasonal changes add new prospective to the wonderful sights since the property has an abundance of large hardwoods and two streams. Wildlife is abundant and part of the charm of this special home, including daily visits by hand-fed deer. Positioned separately on the property are extraordinary equestrian amenities. A paved drive accesses and circles the four-stall Morton barn with shed roof, Dutch doors, large center concrete aisle, laundry room, tack room, storage area and sliding end doors. A riding arena and round pen are adjacent to the barn. Three board fenced pastures with run-ins and water and a large storage/hay barn are close by as is ample room for equipment storage. The property has access to approximately 17 miles of riding trails and nearby is Pilot Mountain State Park and its miles of riding trails. Blessed by Mother Nature and the owner’s stewardship make this a very special place. Come see and enjoy the beauty that is here. Make it your home.